It’s been eight years since I left Brooklyn, and I’ve never stopped missing it. I wrote a little bit about that feeling a couple of years ago, and if anything, my longing for the County of Kings has only intensified since then. I’ve always been a South Brooklyn (not to be confused with “southern Brooklyn”) kind of girl. I started off in Cobble Hill right after college, then moved to the “Columbia Street Waterfront District” (quotation marks necessary), and then finally to Red Hook…which is about as South Brooklyn as you can get. It’s also about as massively inconvenient as you can get in terms of transportation and conveniences (this was before Fairway and IKEA opened, of course), and that move to Red Hook really wound up being the impetus for moving out of the city completely and buying our house in Newburgh. I mean, if you’re going to live someplace inconvenient, why not make it really inconvenient, right? Of course, if you’ve been reading this blog for a while, then you know what happened about five years later—we decided to also rent a little apartment in upper Manhattan. You know, for convenience. The apartment has been wonderful. I love Washington Heights (really, it’s great), I love my neighbors, and I lovelovelove the apartment itself. Stuff has changed a little, though. We’re in the city a lot more than we’d anticipated, and Evan got a job in Brooklyn. Which is kind of inconvenient. Yeah, we rented an apartment in Brooklyn. In DUMBO, specifically, which is decidedly not part of South Brooklyn. It’s not North Brooklyn either, though—it’s right in the middle. It’s right on the water. It’s right under the Manhattan Bridge. And it’s beautiful there. The apartment is TINY TINY TINY, and it’s a new renovation—totally different from anyplace I’ve ever lived before. It doesn’t have much character of its own, but I think it’s going to feel good with our stuff in it. We’ll be gradually moving our things from the Washington Heights apartment to the Brooklyn apartment over the course of the next month. We live pretty simply when we’re in the city, so it’s not a ton of stuff, but you know how closets and kitchen cabinets are—they’re sneaky. Daniel has offered to help (and by “offered” I mean he agreed when I asked), and I’m thinking that having the Boy Wonder on hand is going to make everything go pretty fast. I’ll do my best to take photos along the way. And yeah, that’s the view from the roof deck of our new building. Crazy. p.s. We found awesome new tenants to move into our Washington Heights apartment, which makes me really happy. They’re even going to keep the fauxdenza! such amazing news anna (and evan) – congratulations! as a current ‘south brooklyn’ resident (lower court street) welcome back to the borough. if you loved it before you’ll love it even more now since it’s all changed so much in good ways and stayed the same in good ways as well. congrats! Congratulations! And oh my god, that roof deck. Wow. I would spend all my time up on that roof deck!! Gorgeous view. Looking forward to seeing all the fun things you do at this new space. Congrats! Congratulations! That view is amazing! Looking forward to seeing how the place evolves (and borrowing some ideas, of course). Congrats! The view from the roof deck is awesome! Lucky you! Makes me jealous! 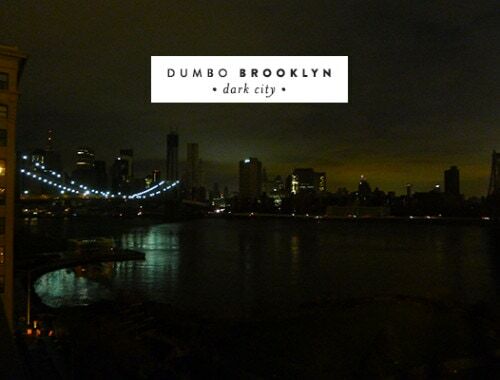 I lived in DUMBO in the late 90s, and then move around Brooklyn for 15 years. I now live in LA…extremely inconvenient i’d say ha! Say hey to pedro’s for me…enjoy!! Wow, that rooftop is the stuff that NY dreams are made of. Gorgeous. Gorgeous gorgeous. Yay!!! What an amazing view. Looking forward to many (hint hint) Brooklyn pictures. Congratulations!!!!!! Brooklyn is extremely photogenic, so I don’t think that’ll be a problem!! Oh, Brooklyn. I miss it desperately too. So happy for you that you get to return! That view is delicious. Welcome back to Brooklyn! I guess I started reading your blog around the time you got the Manhattan apartment so always associated it, the blog, with your Newburgh house. Who knew you were a Red Hook person!?! I’ve lived down in the most inconvenient neighborhood for 8 years and love it, but if not for Fairway would have moved, or starved, years ago. You should move back if you continue southward. Amy, I lived in the Monarch Luggage building on Delevan Street! There was hardly anything in Red Hook at the time, and Fresh Direct wouldn’t deliver to our building. We had to take the bus to the Key Food on Atlantic! It sucked commuting to midtown every day, too. The B61 bus is my nemesis!!! Holy! That roofdeck puts me right back into my interior debate: to build or not to build a roofdeck at my apartment?! I would LOVE to build a roof deck at our house in Newburgh someday! If the view is good…YES, do it. Congratulations! The view from the deck is just stunning. I am going to need to live vicariously through your move as we are still working on all the logistics of moving to NYC from Sydney, Australia. I can’t wait to see what you do with the interiors of your new DUMO place. Wow, good luck!! I wish I could see NYC through the eyes of a person from somewhere else. What an amazing view Anna! Hope the move goes smoothly for you and really look forward to seeing more pictures of your new place! Welcome back! Congrats on the new adventure and the fabulous view. Brooklyn just has a way, doesn’t it? My boyfriend keeps trying to convince me that we should move to Astoria, which is lovely, but it’s no Brooklyn. Congrats! This made me nostalgic for Brooklyn in the early 2000s. That roof deck is amazing! Ha! I moved out of Brooklyn in ’93. I had a studio in DUMBO. Huge. Seriously, it was huge. I think I personally had at least 800 sf and my portion of the rent was $300. But back then it was “a little” rough around the edges… so when I saw the guy stumbling around in the street outside my studio with a knife in his chest I decided it was time to leave nyc. (But mostly the double rent –apartment + studio–was killing me.) So now I visit. I LOVE Brooklyn. Did then. Do now. Always will. Congratulations! Dumbo in the early/mid-’90s was indeed a bit terrifying, I know! I was pretty shocked to see how drastically it’s changed even in the past few years. In all honesty I think it’s a bit overboard at the other end of the spectrum now, but for the time being it’s a good choice for us. I am so f-ing jealous of that view. so so so jealous. It is so important to live where you feel comfortable and at peace, so much more important than for example the size of your home. Super exciting!! 🙂 Welcome back to Brooklyn! Coincidentally enough, I work in DUMBO now at 45 Main so perhaps we will cross paths 🙂 Good luck with the move–that rooftop view would be enough to convince me to lug all my stuff to a new apartment. Yay! Brooklyn is massive! Next time you’re here, you should definitely (at the very least!) walk across the Brooklyn Bridge. Can I like this post fourteen times?! Not like I’m biased or anything. Huge congrats to you, and can’t believe it’s all happening so quickly! Good luck with the move this weekend! Congratulations! That view is amaaaaazing! So pleased for you Anna. And even more jealous as usual that you get to live in New York. There’ll be some beautiful evenings to come home to on that roof deck. 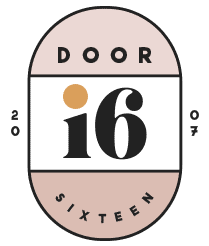 I remember being kind of gobsmacked the time you posted pics of the view from Door Sixteen. I just assumed you were in a built up area, had no idea you were so close to that amazing expanse of the Hudson River. I do love my river views, it’s true! The lower Hudson Valley is a wonderful, wonderful place. That view is amazing. I can just imagine eating a candlelight dinner out on the roof when the weather gets warmer. Congrats on the new place! I have every faith it will look as awesome as everything else you do. That ‘roof deck’, as you say, looks amazing! I like the term too. Where I am in the UK we’d say ‘roof terrace’! I love DUMBO. I loved it before it was even “cool”. It’s an arm and a leg, and half of my liver to live there though. Enjoy it. Um…OK. I hope I will. Extremely jealous but disproportionately happy to see all your before & after photos of the new space. Can’t wait to see what you do with it. Aren’t tiny places more fun to decorate? That view is spectacular. I live in a valley in the mountains, so this kind of stuff always mesmerizes me a bit… it’s so beautiful; I can see why you’re in love with it. Congrats on the new place! Designing a new space is always fun. Congrats on your return to Brooklyn, can’t believe that view – I can see how easy it’d be to make the decision with that in mind! i have linked to you, with thanks and congrats. welcome to dumbo!! i work there – 20 jay – being close to both the F and A is convenient – though personally i feel it lacks some eateries and a grocery store! but it’s fun and that view of the city can’t be beat! I am SOOO jealous. I wish I could move back to Brooklyn. Living in CA has it’s advantages, but their is nothing like Brooklyn anywhere in the world. Wow. Congratulations. I guess it’s too late now, but does anyone need to rent a glorious top floor Victorian apt owned by a set decorator for rent near me with tons of on-street parking in Bed Stuy? Close to the Jackie Robinson Parkway for quick commutes to the lower Hudson Valley. 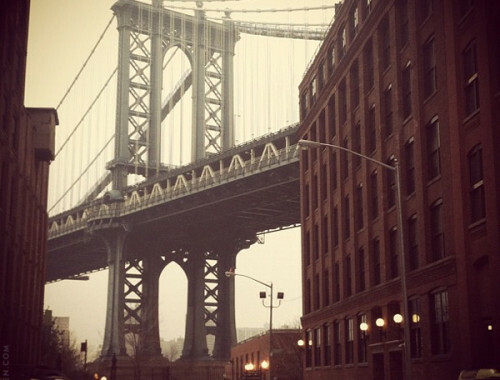 That picure of Brooklyn is awesome. I feel like I need to visit it – haven’t been yet. What a wonderful view and very calming – standing on the BB, looking at the view makes me feel at peace more than anywhere else in the world. Yay, I love when you move to a new place because it’s fun to watch you set the place up. Wow, is that your view. Incredible. what an amazing view! yay roof deck! I thought I saw that you were moving… but to DUMBO!!! My hood!!! Aww I would love to meet Fritz and Bruno sometime, do you think they like a long dog?! Maia loves smaller dogs 🙂 good luck with the move!! Cheers to DUMBO roof decks! I’m actually in the process of buying an apartment on Bridge street. I can’t wait to be up there–both on the roof and not in southern Brooklyn. Enjoy your view! I only really like Brooklyn Heights, Fort Greene and yeah, Dumbo! It’s a great neighborhood. I wonder what the noise will be like, though. You can probably tune out the train/bridge, but I don’t think my husband could! who would not want the fauxdenza?! id brave a little time in bayview correctional facility if only i could get it out of one of the darn windows and didnt live in england! WOW! You have romanticized the boro as only an outsider can. Grew up there, could not wait to get out when I was a teenager. Hated being a Bridge and Tunnel New Yorker! To Brooklynites where you’re living is known as the general place of “DOWNTOWN BROOKLYN”. Ruth, my husband is a third-generation Brooklynite and my family’s own provenance reaches back over a hundred years in the outer boroughs of New York City, so it’s entirely inaccurate for you to use the term “outsider” in this case. Regardless, New York is a city of outsiders. Outsiders are what make this a wonderful place to live. I love New York—all five boroughs of it—and I think it’ll be a sad day when we close ourselves off to the idea of people being able to come here from other cities, states and countries to find happiness. I too grew up in a town that I couldn’t wait to leave when I was teenager. That’s normal; it’s part of growing up and experiencing new things. Far be it from me to disparage people who have moved there since I left, though, and there are many. I’m glad you’re happier on the Upper West Side, but do remember that you, too, are an “outsider” there. You are entitled to find your own happiness there just like people who have there their whole lives, and you don’t deserve to be mocked for that happiness. And guess what? Neither do I.
Yeah Brooklyn! The best place to live. I know you lived and live in Brooklyn but Cobble Hill and Red Hook are not South Brooklyn. There are miles and many neighborhoods that are South Brooklyn that get ignored just because they aren’t trendy. So please don’t leave out Midwood, Bayridge, or Bensonhurst, etc. they are all great places to explore. My use of the name South Brooklyn to refer to my old neighborhoods has nothing to do with excluding other neighborhoods or “trendiness,” it’s just to distinguish a particular area with the name by which it is familiar. Wow, that’s interesting. I had no idea. Thanks for the link, I always enjoy learning something new about BK. Congratulations on this new adventure, Anna! I don’t know how you can stand to part with the fauxdenza, though. It’s so lovely! woh! you guys are moving to dumbo! look forward to seeing the apartment! i love it here. you will love the view!! That view is absolutely amazing! I live in Philadelphia, but your photo makes me want to live in Brooklyn. Wow, that view is incredible. 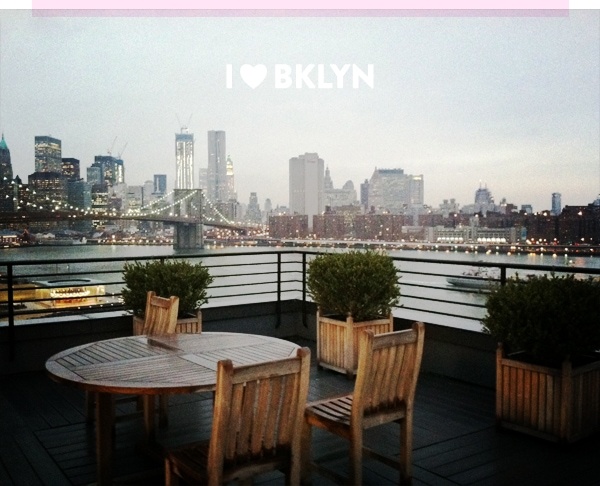 I love Brooklyn too. Looking forward to following your decorating adventures in the new apartment. I’m so happy that you get to live in this new, fun place. Yay! I have a special fondness for Brooklyn, from one of my all time favorite books: A Tree Grows in Brooklyn. When I visitied Manhattan about 10 years ago, I made it a point to go to the Lower East SideTenement Museum. These tenements are not in Brooklyn, of course, but close enough. Being there was incredibly interesting and very moving. Anyway. Enjoy, and I’m looking forward to seeing your new place and your new neighborhood. Selling New York (that real estate show) has featured the swanky apartment in the Clock Tower. Are you near that? Hi! I haven’t written in your blog for a while! =) I have been visiting it, though. I’m really looking forward to seeing the pictures of your new apartment. I love Brooklyn. I lived there for a month when I was in New York one year and a half ago to study English. I used to live in the East Flatbush section of Brooklyn (Do you know it? ), and I have missed it so bad since then! I used to travel every single day from Brooklyn to the Empire State Building (where the school was), which used to take me some time and several journeys by bus and by subway. Anyway, I loved everything about that, I liked everything there. It was so nice… You’re lucky to have that view from your new apartment. And you’re lucky to live in NY. My mind definitely cannot handle the idea of new, completely blank white spaces. 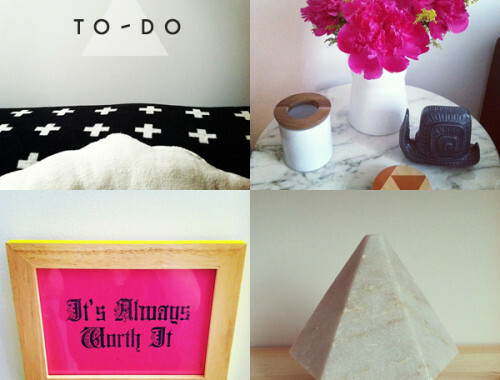 I also feed off of restriction when it comes to interior design. I turned one place down that I saw during my most recent apartment search because of it! (And definitely partly because it was in Bushwick and I’m no longer 23 and dating a boy in a band. Which is what part of my life Bushwick reminds me of.) It was a two-bedroom so large that the previous tenants turned part of the living room into an office/third bedroom! With a large balcony. Someone else’s gain. But probably not someone else who obsesses over design so much as I do. Anyway, I also can’t wait to see the new place and how you approach the challenge of having a blank page with which to play with, as daunting as that might be. Wow….never thought that brooklyn could be so beautiful. what a view!